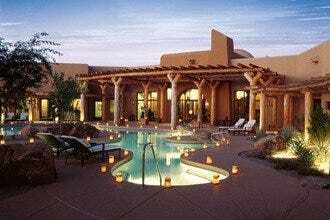 This AAA Four Diamond Resort is perched on scenic Camelback Mountain, giving lucky guests ample opportunity to drink in the gorgeous desert sunsets. This 53-acre luxury Scottsdale resort features mountain and spa casitas, and an Asian-inspired spa featuring signature facials, body wraps and massages. Relax in the meditation garden and watsu pool, play some tennis, or follow one of the walking trails to explore Camelback Mountain. There is also a state-of-the-art fitness center and movement studio where you can practice pilates, meditation, yoga, fitness and nutrition consultations. This boutique resort spa is famously tranquil, yet still within easy reach of Scottsdale shopping, arts and cultures, and of course, golf. Spas: "One of the spa's most popular offerings is the Satori Wellness Retreat, a four-day customized wellness package that includes healthy meals, an individualized fitness program, and unique spa services." Best for Spas Because: The Spa at Sanctuary is an Asian-inspired spa retreat with beautiful surroundings, including a watsu pool and meditation garden.